Athens was a wild card, a crazy idea. My four children and I had planned to go to Cairo over the winter break and, while booking the one-way ticket back, I realised that there was an option with Aegean to fly via Athens with a 10-hour stopover. Immediately, my mind was filled with images of the Acropolis, the Parthenon, assorted Greek islands and pristine horizons. Could we really add Greece to our list of countries visited? A few clicks on skyscanner.net told me that, yes, we could. Minted. It occurred to me then that there might be a way to lengthen our stay: I researched the price of a one-way ticket from Cairo and a one-way ticket from Athens to Manchester three days later. This option actually ended up being cheaper and it was then that I knew that this was really happening: we were going to Greece! The day of our departure dawned with a mixture of sadness and anticipation: we were leaving loved ones in Cairo but we were on a new adventure together. I realised that this was the first time I would be travelling to a strange city, a city where we knew no-one, with my children, my two big boys and my two little girls. This was going to be our first big adventure together. We learned our first Greek word on the plane: ‘Kalimera’. Good Morning. The Greek air hostesses loved this, especially when the children said it, and were certainly very friendly and attentive. The flight was over before we knew it. After retrieving our bags, we found ourselves in the Arrivals hall, weighing up our options: would it be more sensible to take a taxi into town, since we didn’t know our way, or take a chance and hop on the train. The lady behind the desk dismissed the idea of a taxi, loaded me with maps (metro, city, city centre) and sent us on our way towards the Metro station. After buying tickets for four of us (the little one travelled for free), we made our way to the platform and were soon seated on the fast train into Athens. Two of the children promptly fell asleep and I gazed contentedly out of the window for the duration of the journey, as we sped through the open countryside towards Athens. I was struck by the topography of the place. It was unlike any I had ever seen. I was fascinated by the red earth, hilly terrain, cypress and olive trees, with their silvery leaves, that dominated the landscape. I was not the only one who was fascinated. 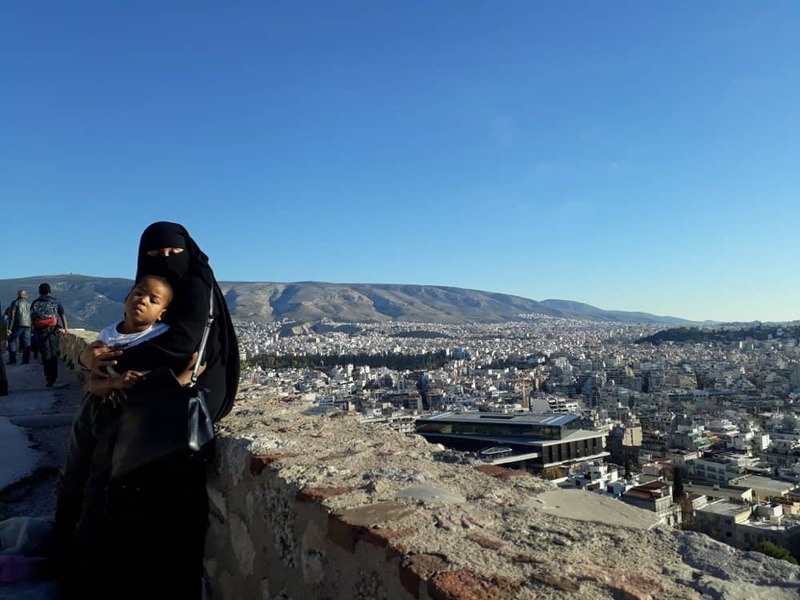 From the moment we boarded the plane to Athens, we were a curiosity for the locals: four Black children and a woman all in black (aside from my woolly scarf) with her face covered. We stood out everywhere. And, yes, people stared, puzzled, trying to work us out, trying to fit us into some sort of box: Africa immigrants, Syrian refugees, asylum seekers. I’m sure they came up empty-handed. I don’t have a problem with stares. As a woman in niqab who has travelled extensively, I am used to being stared at and it doesn’t phase me. Athens was no different. But what stuck with us was how accommodating Greek people were once we made contact with them. A greeting, a question about directions, help with a translation, all these were met with openness and warmth and, for that, I was very grateful. Once in Monastiraki, we changed lines and hopped onto a train emblazoned with graffiti from end to end. We were to find out that this is a particular feature of Metro Line 1 – the ‘green line’. We were now on our way to Petralona where I had booked an apartment via booking.com. 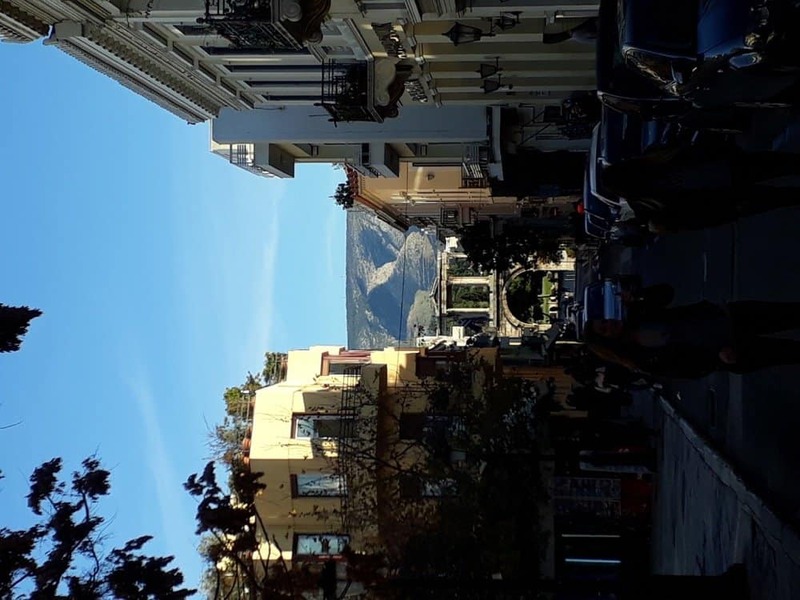 When the train came out into the open again, we marvelled at our first proper sight of Athens: pastel-coloured and retro, with streets studded with orange trees, lined by low-rise flats with canopied balconies, framed by mountains in the distance. And, from what we saw, lots of graffiti and street art everywhere. After finding our apartment, the children rested while I took advantage of the free Wi-Fi to let family and friends know that we had arrived safely. 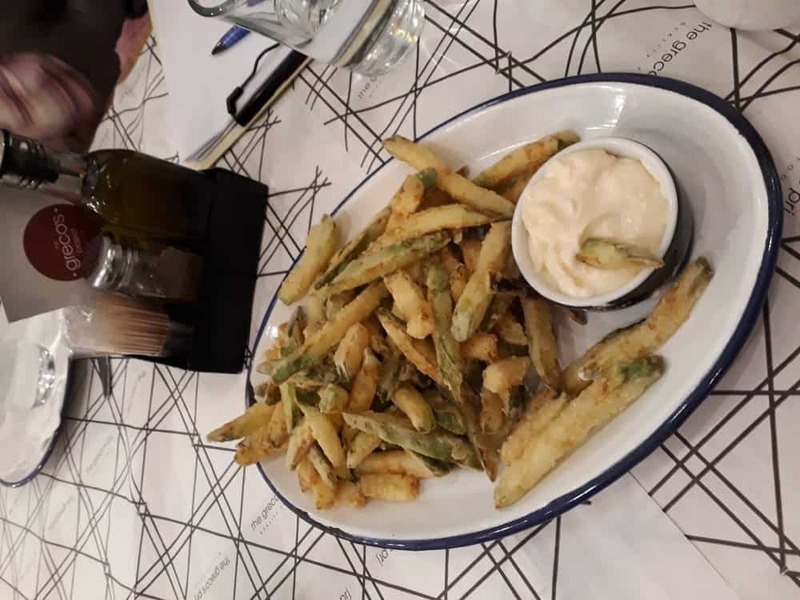 I knew that we only had that night and two days to squeeze in as much as possible so I decided that, instead of wasting that evening, we would go out and find somewhere to eat, perhaps experience what Athens was like after dark. We took the metro back to Monastiraki, armed with two recommendations for where to eat dinner. We emerged from the station into a square full of groups of young people, couples and families, walking purposefully across the square, lounging on benches or sitting at the tables that line it on one side. I could see immediately that this was a true Mediterranean city: being out after dark was family friendly and eating outside was standard. The children stared around, enthralled at the sight of the ancient buildings that were scattered around the square, with their imposing stone pillars and ruined stairways. From where we stood, we could see the Acropolis, its columns and pillars illuminated against the inky night sky, high up above the city. After dinner, we decided to join the crowds of people milling around and explore the streets that flow out from the main square. The restaurants, cafes and desserts bars that lined the side streets were bustling and we saw so many delicious desserts that we wanted to try. In the end, we decided on frozen Greek yoghurt pots from Yogolicious, a local brand offering delicious frozen yoghurt, some serious topping choices and a really cool, retro vibe. I highly recommend the biscuit flavour yoghurt with cranberries, chocolate and pistachios – divine! Thus ended our first successful foray into the heart of Athens and we returned home on the metro, buzzing and eagerly anticipating the days ahead. It was a great start, alhamdulillah. The next day dawned to the sound of raindrops falling on the rooftops outside my window. 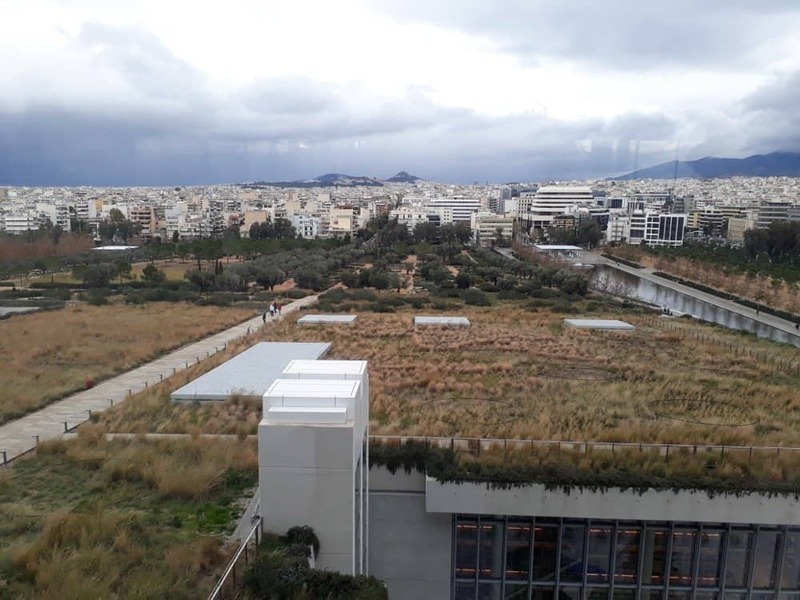 It didn’t seem like a walk across the park to the Acropolis was feasible so I whipped out Plan B: the Stavros Niarchos Foundation Cultural Centre. Housing the Greek National Opera House and the National Library of Greece, I was first introduced to this wonder of modern architecture between the pages of the Aegean in-flight magazine. One look at the pictures and I knew we would have to visit this iconic building for ourselves. A rainy day presented the perfect opportunity. A short metro ride to Omonia, a change to Metro Line 2 (‘the red line’) towards Sygrou Fix, and we found ourselves in a part of Athens with a totally different feel. Here there were no ancient ruins or cobbled streets, instead, there were wide roads full of traffic, office buildings and quite a few rather questionable establishments lining the road. We caught a cab to the Cultural Centre as I was not in the mood to battle with the rather unpredictable weather and figuring out the tram system. About 10 minutes later, we were there and all I can say is that the place is awesome, in the literal sense of the word. A vision in concrete and glass the SNFCC, as it is known, soars into the sky above the city. Apparently, the architect, Renzo Piano, envisaged it rising up like a dislodged piece of the Earth’s crust. This description becomes apt when you take the glass elevator to the top floor above the Opera House and see that the roof of the library opposite actually slopes down towards the ground and is covered with vegetation, pathways and rock features. I can’t quite express the feelings and thoughts that overtook me as I rose in the elevator: as we got higher, the city of Athens miraculously appeared from the behind the buildings and opened out to the mountains beyond, shimmering as the sun’s rays broke through the clouds. 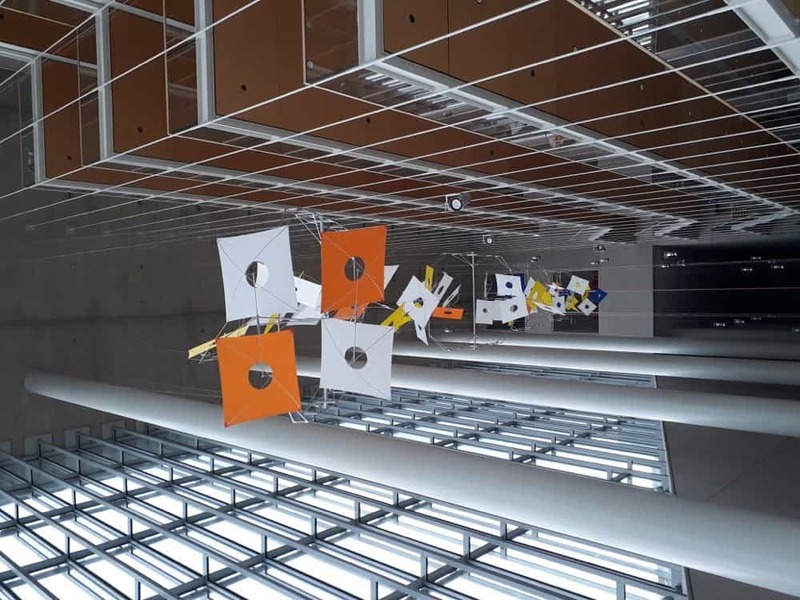 Beyond the lift and the glass corridor, space opened up in an expanse of concrete, above and below us, and we found ourselves facing the sea, with the city behind us. It literally took my breath away. I have never been so awe-struck by a modern building in my life. The SNFCC is literally a masterpiece of modern architecture and I am thoroughly convinced that no visit to Athens would be complete without going to experience it. The children were equally impressed and spread out across the rooftop terrace: two went to use the sea-facing telescope, the other two went down towards the gardens, carrying cameras and sketchpads. Overwhelmed by it all, I took photos, video, trying to put into words what I was feeling and seeing, as I have just done. I am sure I have failed miserably. The only way to know it is to see it for yourself. Reluctantly, we left the SNFCC to find some lunch and, seeing as there was still daylight, try to squeeze in a visit to the Acropolis. 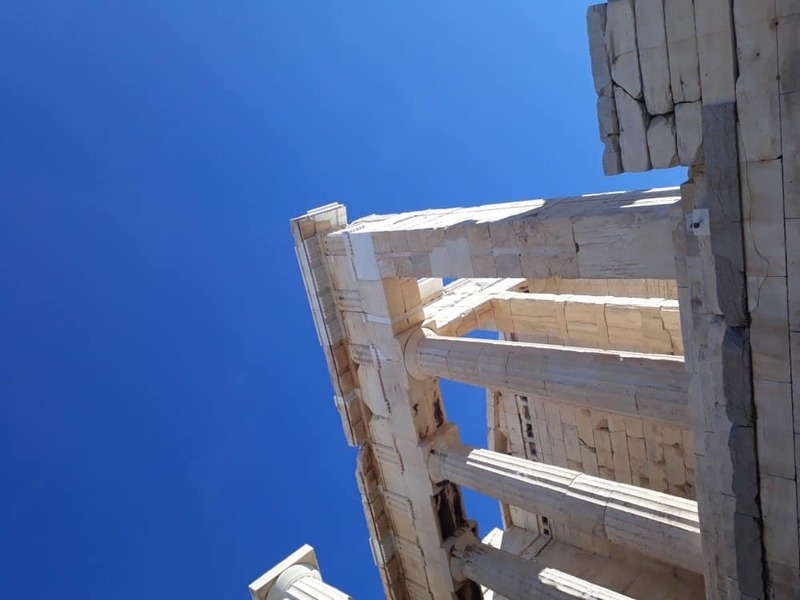 By the time we arrived, however, the museum and the site was closed but, happily, we found ourselves right in the middle of the maze of streets that surrounds the Acropolis and were able to start crossing off another ‘to-do’: shopping for gifts. Amongst the shops selling replicas of Greek statues and keyrings to die-hard tourists, we found some real gems and met some wonderful people. The Greek managers, assistants and waiters we met impressed us again and again with their warmth and courteous good manners. 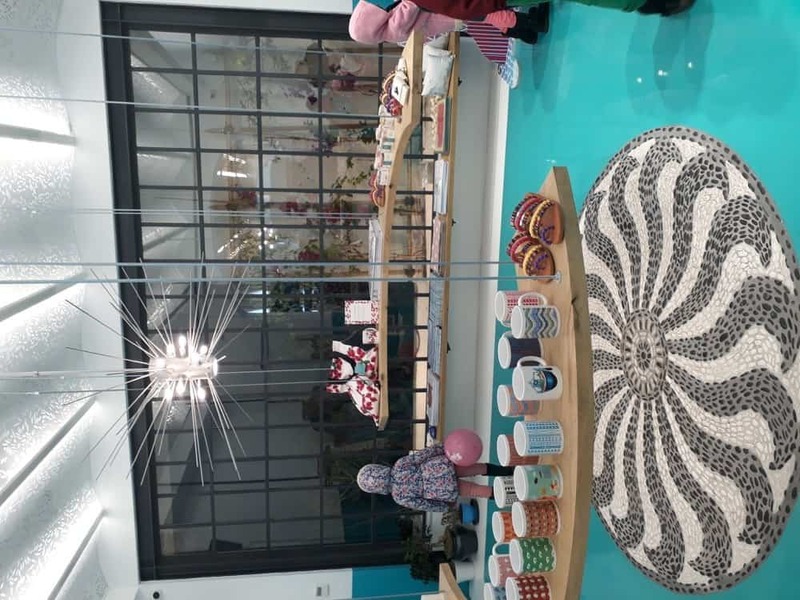 We stocked up on Greek olive oil, olive oil soap, items made from wood from the olive tree, Greek pastries, handmade jewellery and stationery and homewares designed by young Greek artists. 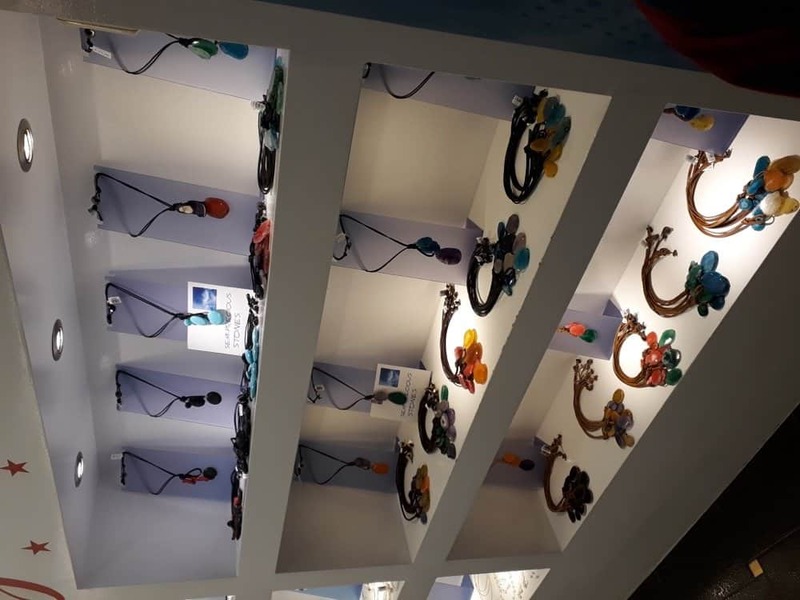 Two shops, in particular, captivated me: Athens Protasis, a brand making handmade jewellery with leather, glass and semi-precious stones, and Anamnesia, a gorgeous store full of quirky designs rooted in Greek traditional culture, but with a fresh, modern twist. Their shop display was amazing and I could literally have bought all my souvenirs from there! We discovered all these stores as we wandered the streets, having a vague idea that we were headed back to Monastiraki. Our suspicions were confirmed and we found ourselves back in our beloved square and the children asked to eat at the Greco’s Project again. I resisted another day of Yogolicious and, instead, set off to find ‘the best dessert place’ in Athens, one ‘Nancy’s Sweethome’. This very busy dessert and coffee shop turned out to be in a rather ‘interesting’ road off the main square and I do remember thinking that maybe going on a hunt for a chocolate dessert at night in a strange city with 4 children in tow was not the best of ideas. But, just as we were about to turn around, we found ourselves facing the store which was literally heaving with people. We were seated on some rickety chairs on the pavement beneath some orange trees and were soon presented with a latte and a very rich – and quite naughty – chocolate dessert. I was able to satisfy my craving while laying claim to having visited ‘the best dessert place’ in Athens. 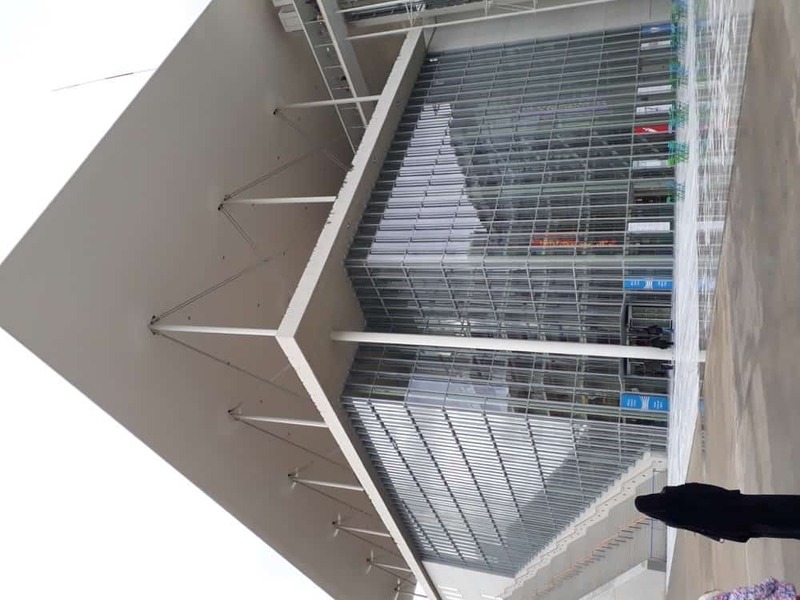 We were blessed with gorgeous weather the next day and we set off bright and early for the Acropolis Museum, another impressive modern building made from, you guessed it, glass and concrete. One of the most amazing aspects of this museum is that, in places, the floor is made of glass and you are able to look down on the excavations happening below. The museum had a calm, reverent atmosphere, filled as it was with marble statues of Greek gods and their acolytes. 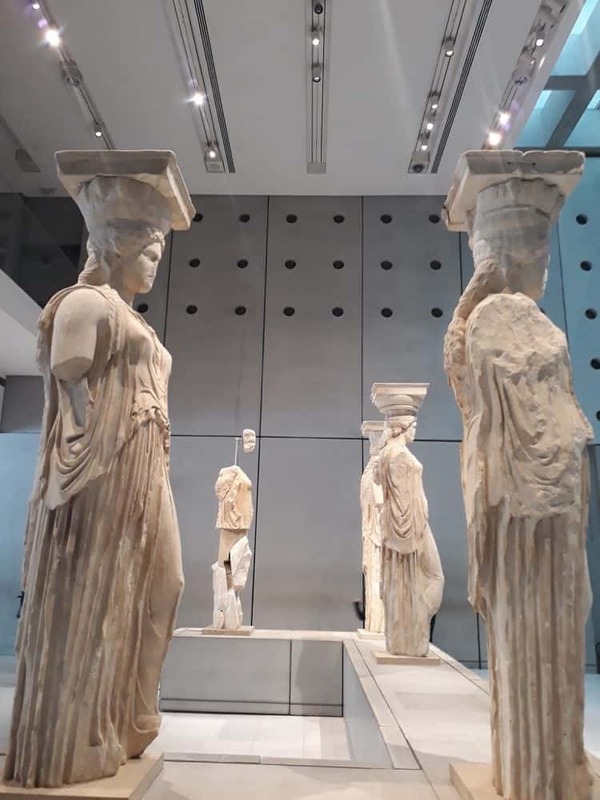 The information provided next to each exhibit was particularly useful and helped us understand what was in front of us, mainly, dedications to the goddess Athena, for whom the Acropolis was built and after whom the city was named. 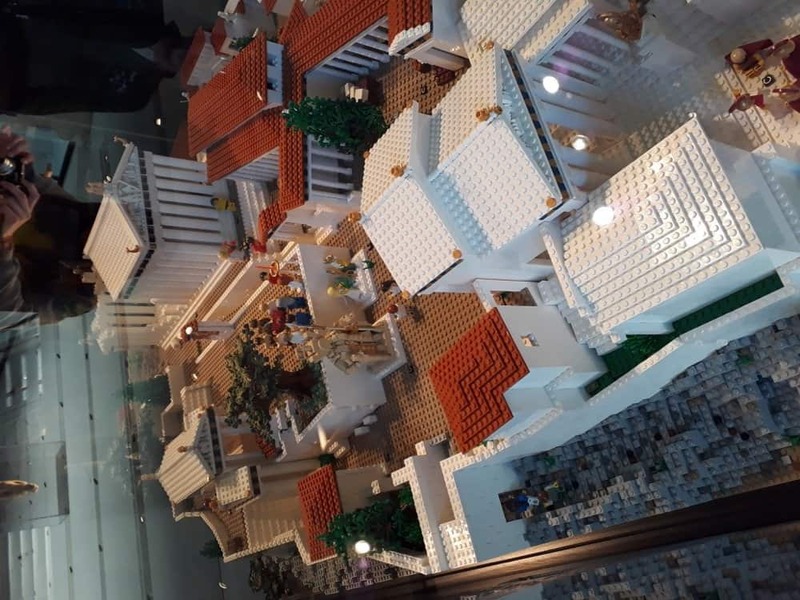 One of the coolest things in the museum is the Lego replica of the Acropolis complex. The children were fascinated by all the detail and became quite excited to see it for themselves. So that’s what we did next. After buying tickets, we began the climb to the summit. The blue sky, the sunshine, the sea shimmering in the distance, were all the stuff that dreams are made of. We could not have asked for a more perfect day to see these ancient ruins. 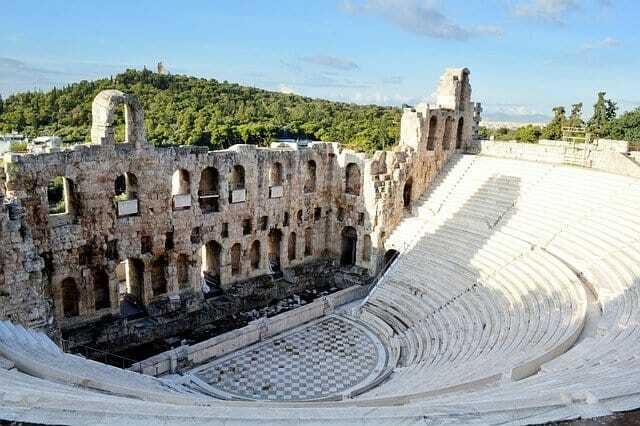 The climb itself offers many detours but my favourite was the Theatre of Dionysus, situated at the bottom of the hill. Still largely intact, the walls of the theatre jut into the air above the theatre, reminding me of the ruined archways of the abbeys in England. It was very impressive. Before long, we had reached the entrance stairway with its great marble columns and we took a moment to appreciate the view. Absolutely stunning. In a way, it reminded me of the view from the Sulaymaniye Mosque in Istanbul, also built on a hilltop. The logic of situating places of worship high above the city was quite clear: this is our highest calling. This is the summit of our achievements. We wandered the ruins for a while, admiring the columns and pillars but, mainly, the superb view of the city and the sea. To be honest, if you have ever seen the Great Pyramids of Giza or the temples of Karnak and Luxor, the Acropolis may pale in comparison. For me, the treasures of the Acropolis – and the wonders of the civilisation of Ancient Greece – lie in the museum below. The site itself did not leave us breathless with admiration – but that could be because we have been spoilt by too much access to the work of the Ancient Egyptians! All in all, it was well worth the climb and I was pleased that we had seen it with our own eyes. It was a day we will never forget, alhamdulillah. We ended the day at an amazing restaurant in Pireaus, overlooking the sea, marvelling at the last few days and all that we had seen, heard and done. It was definitely a beautiful moment for my children and I, a moment of thriamvos, a moment of triumph. ‘Really?’ he asked, eyebrows raised. I thought for a moment of some of the beautiful cities I have been blessed to visit: Istanbul with its awe-inspiring Islamic heritage and calm, dignified atmosphere; Zurich, with its charming historic buildings lining the lakeside, framed by fairytale mountains; Lisbon, with its pastel shades, grand squares and steep, winding streets; Andalucia, with its grand yet melancholy history and picturesque markets… Each city held precious memories. Each city has left a mark. Is Athens really my favourite? Well, I believe that our personal experience of a city is what makes us either fall in love with it or vow never to return. And I can say, without doubt, that my personal experience of Athens and the Greek people, was a positive one, a beautiful one, a precious one, for myself and my children. They can’t wait to go back and explore Athens and the other islands of Greece – and neither can I. Learn to say ‘hello’ (Geiya Sou) and ‘thank you’(Euxaristo) in Greek; it really opens people up. As well as a seasoned traveller, Na‘ima B. Robert is an award-winning author and founding editor of SISTERS Magazine. She documents her adventures, at home and abroad, on Instagram @naimabrobert. Sometimes the greatest trips are those that happen on a whim. Athens really is a magical city. So happy you had such a positive experience.